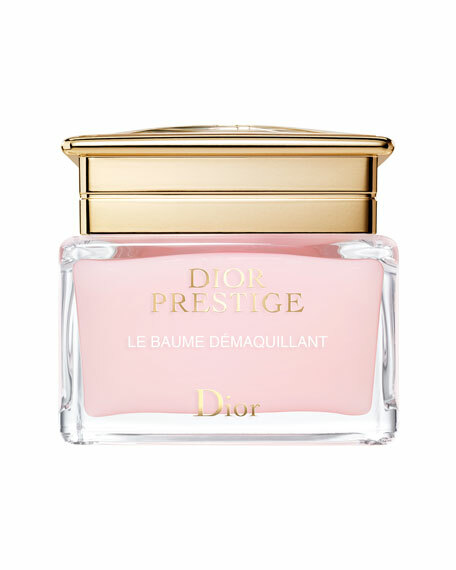 Enriched with rose wax, the delightful DIOR Prestige Le Baume Démaquillant deeply and gently cleanses the skin. The story of this Rose begins on the cliffs of Granville, not far from the childhood home of Christian Dior in Normandy. 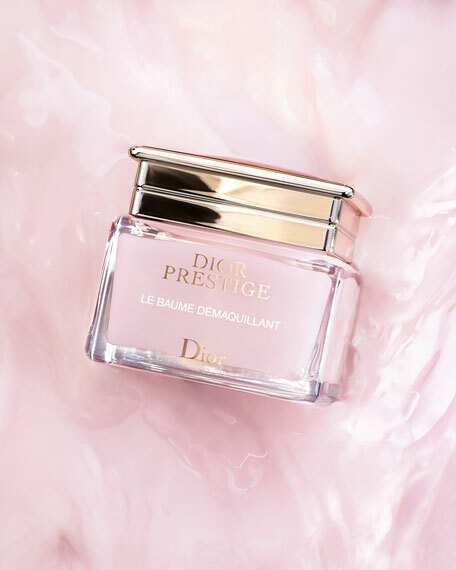 Here, Dior researchers discovered a wild rose capable of withstanding the harsh marine climate while maintaining its exquisite beauty.Through 7 generations of hybrids, a brilliant horticulturist tamed its wild nature and enhanced its regenerative potential. 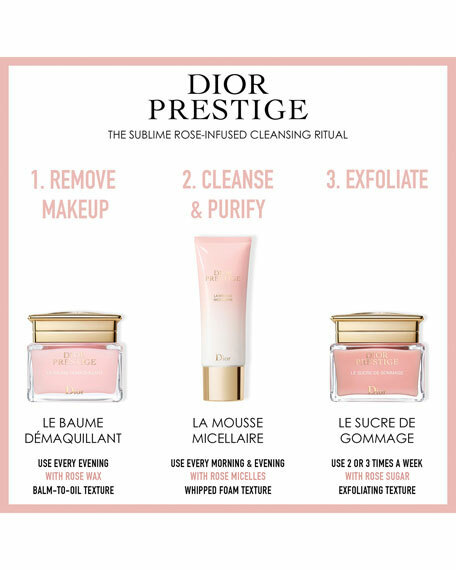 This gave rise to the Rose de Granville, the first rose* specifically created for skincare. 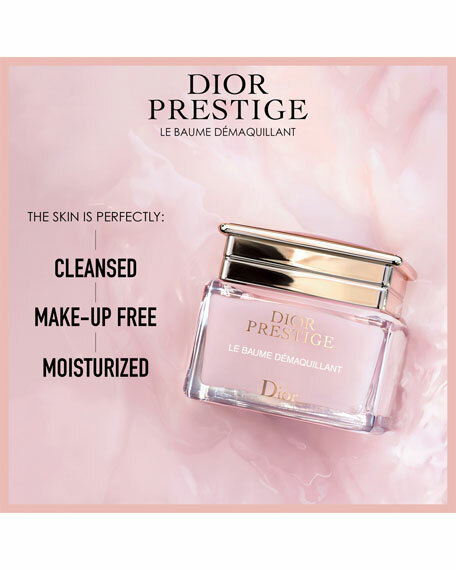 The culmination of 15 years of research, Dior Science has isolated for the first time ever the secret of its unprecedented life force: a unique combination of 8 molecules.This power is at the heart of Dior Prestige skincare. *Self-evaluation by 32 women after 4 weeks of use. Smooth a generous amount of balm evenly over the face. Massage with your hands using deep, broad, circular motions from the center of the face outwards until the texture transforms into an oil. Gently apply a small amount of cream to your eyelids. Close your eyes and massage them using a circular motion, gradually moving downwards to the lashes to remove makeup. Emulsify the oil with a small amount of warm water until it transforms into a milk. Rinse with clear water then gently dab with a soft cloth, leaving the skin moist. A pioneer in ethnobotany for over 20 years, Dior Science identifies in nature the rarest and most powerful flowers cultivated in soils most favorable to their growth. This has resulted in dedicated Gardens around the world. Dior Science's unique transformation expertise* allows it to extract the part of each flower that is the purest and most effective for the skin. Derived from a cliff-growing rose discovered in the garden of Christian Dior, the Rose de Granville boasts twice the vital energy of a traditional rose. ** It is cultivated in the Loire valley garden, in the heart of the best French terroir. Grown organically in the ground, this allows it to fully express all its cellular vitality. Dior LIFE Sorbet Rich Cr? ?me, 1.7 oz.